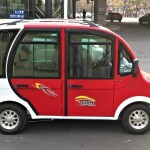 « Day 177 in Beijing: Where did all the 4s go? Day 178 in Beijing: Okay. I’ve Changed My Mind. I Want This Car! 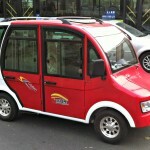 As I’ve been walking around I’ve been taking pictures of the cute cars around Beijing. I’ve found some pretty hip and cool cars but this one blew me away. The driver kept smiling and waving to me as I took the pictures and seemed to get as much enjoyment out of our quick connection as I did. I love the funny little nose on this car and how the windows are so large. 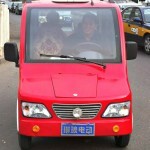 It seems to be quite safe and would allow the driver and passengers to see everywhere. It reminds of something in Disneyland from my childhood. Just enough room for the family. It really is too cute.